This book is no longer in stock at the publisher. Remaining stock is now held by the South Alberta Veterans Association. The book can be ordered from the South Alberta Regiment Veterans Association www.sarvaofcanada.ca. The South Alberta Regiment was formed in 1940 from five ­Alberta militia units. The “South Albertas” forged a splendid combat record in World War II as the Allies advanced across northwest ­Europe, and photographs of their tanks garlanded with flowers and flags and surrounded by jubilant ­Dutch civilians are familiar to many Canadians. The story takes the “boys from the bald-headed prairie” from the Rockies to the Rhine, including a detailed account of the SAR’s most famous action, the controversial Battle of the Falaise Gap in August 1944, where Major David Currie earned the Victoria Cross in four days of vicious fighting at the village of St. Lambert-sur-Dives. South Albertas provides a compelling account of what life was like on the very point of the pincer movement with which the Allied armies were attempting to encircle the German armies caught in the famous pocket at Falaise. 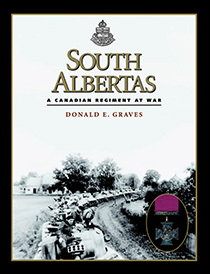 Upon its publication in 1998, South Albertas was greeted as a remarkable work that set a new standard in regimental histories, both in the quality of Donald E. Graves’s text and in the quality of its presentation.